We’re very lucky in Australia, having beautiful natives birds living in our backyards. With a little extra work, you can make your garden the perfect paradise for your feathered friends and ensure that they’re kept safe, fed, and hydrated. Native plants are the best source of food for birds. Flowers such as Grevillea, Callistemon, and Anigozanthos are perfect for nectar feeders such as Honeyeaters. Try planting Correas to ensure flowering throughout the cooler months as well. Red, pink and yellow flowers are said to be best. Native grasses provide seeds for Finches and other seed eaters. It is also important to provide understorey thickets to protect smaller birds from predators, and create bushy areas for nests. Fairy-wrens and Willy Wagtails will especially love these spots. Insects will also be attracted to flowering plants, bringing insect-eating birds. This will ensure that pests are kept at bay. Definitely try to limit the amount of chemicals you use in your garden. Especially avoid harsh pesticides such as snailbait. Organic is best. 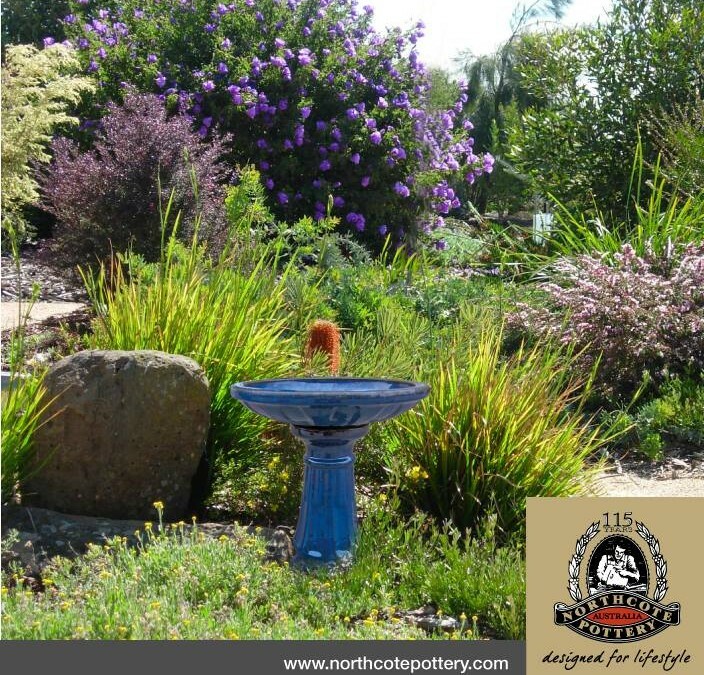 A birdbath from Northcote Pottery is the best way to provide water for the birds. The will apprieciate it for drinking and bathing, and will feel safe being high up and able to fly away at the first sign of danger. Position it in a protected position, near a window for you to enjoy.